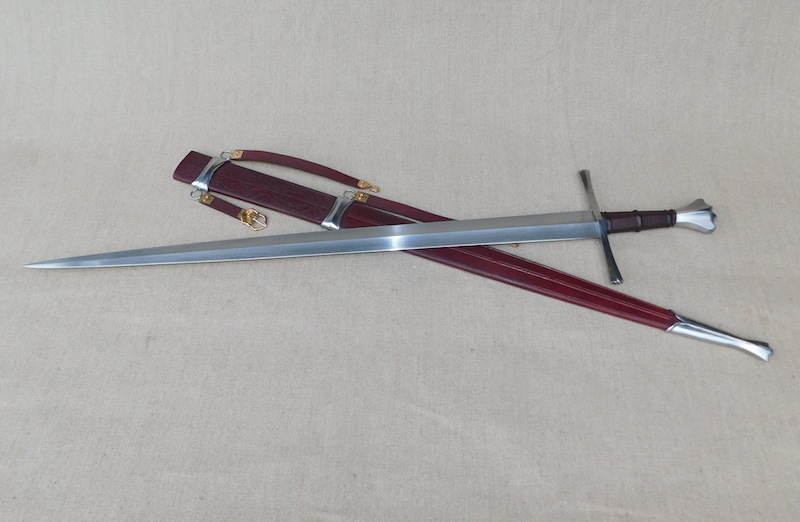 This is a scabbard for an Albion Burgundian that is sort of historical and sort of fantasy, but hopefully interesting and pleasing. Layout and details by my client. 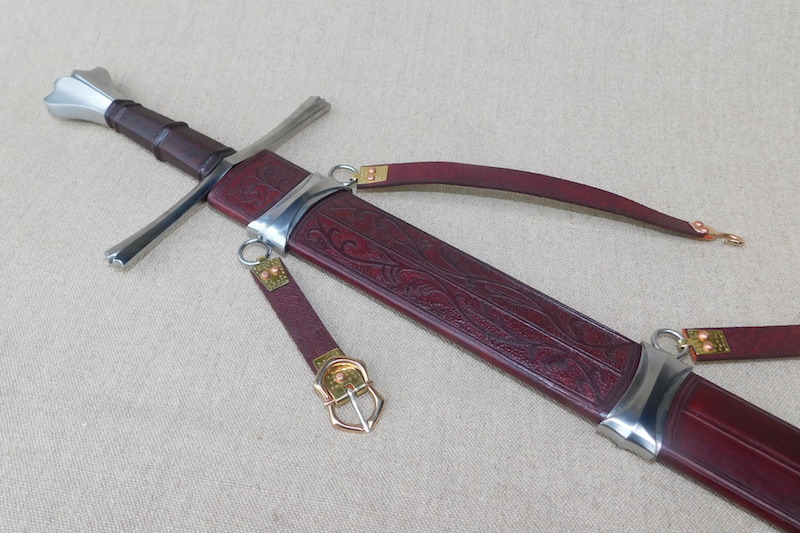 The scabbard itself is made with a poplar core and covered in carved veg tan leather and dyed a dark red. The straps and belt set up are historically accurate for the period and are embossed and fitted with bronze and brass hardware. 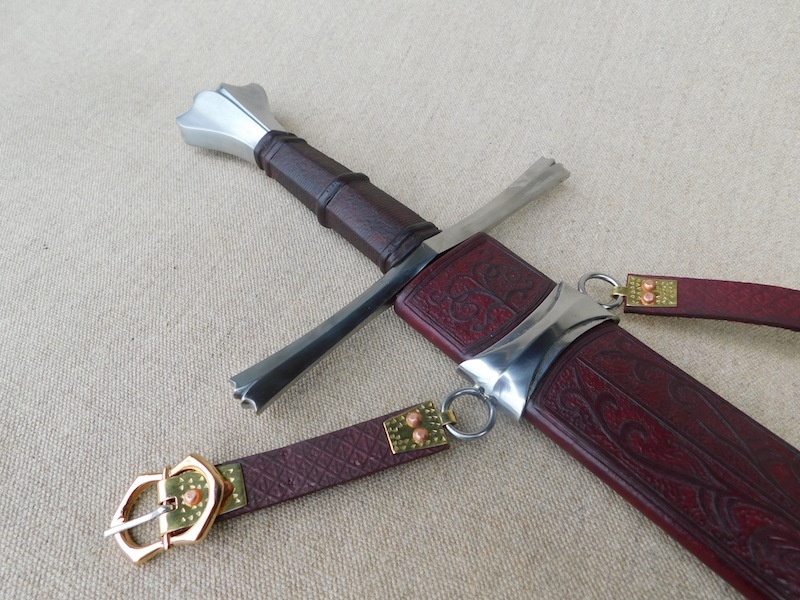 The decoration is a little 'elven', but the scabbard fittings are really pure fantasy. They are fabricated from steel and are meant to echo the curves and features of the Burgundian itself. I hope you like it and of course any comments or questions please fire away. I think it hits just the right note, IMO this is how fantasy aesthetics ought to be. Very nice Leo, as always. I keep hoping to see the Maximilian on your Albion Sword Scabbard List. 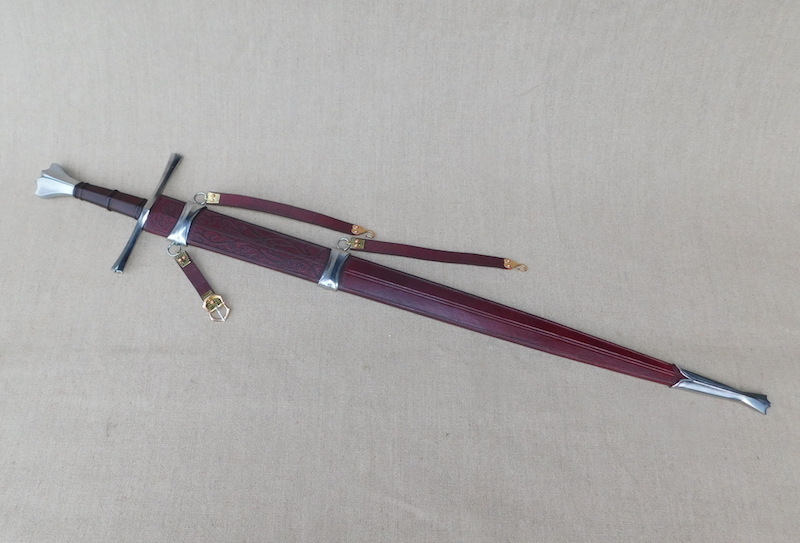 (hint, hint) I'd love to have one made for mine, but shipping is prohibitive for a sword that size. If I was to be critical of this, I'd say the chape has "too much weight to it," if you will. 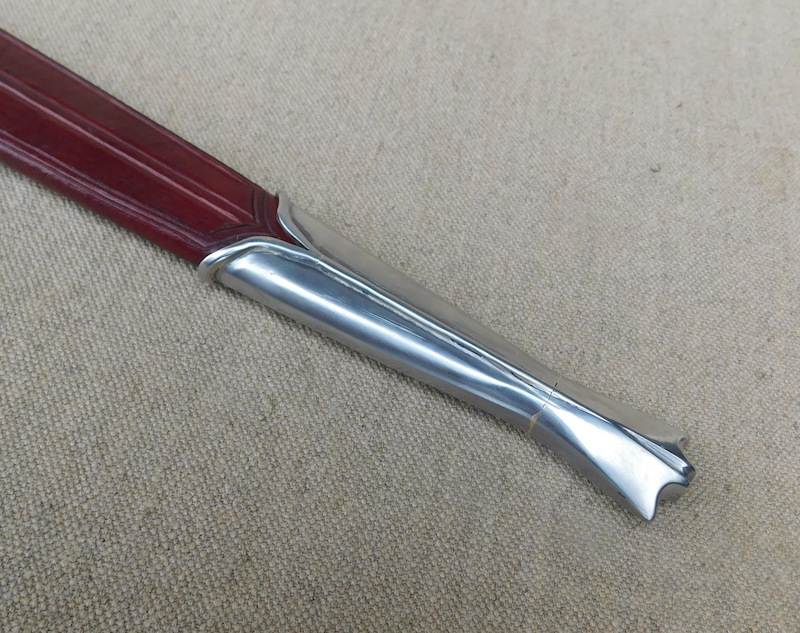 It tends to swallow the tip of the scabbard rather than simply cover the edges. And that's all I can be critical about! In the end, it is a chape, and it does what it's supposed to. Aside from the artistic critique, everything else is wonderful. 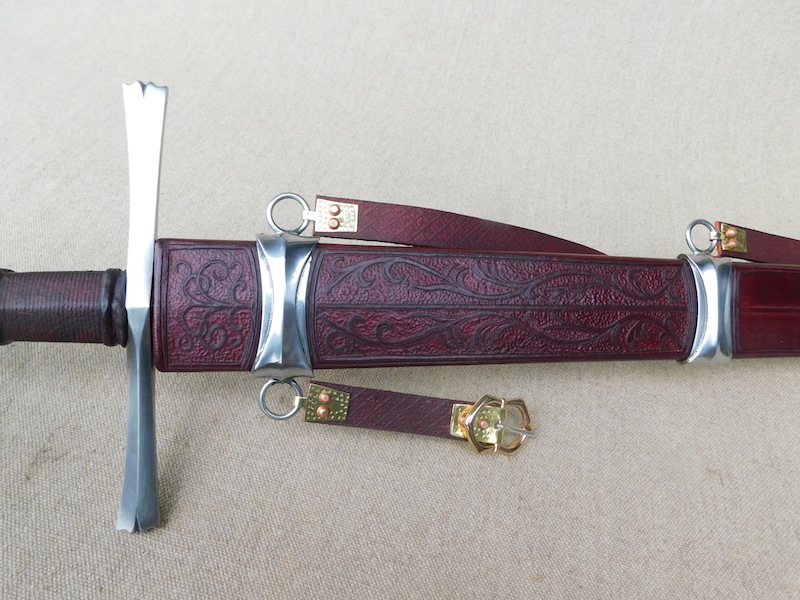 The lines / carvings and even the color of the scabbard are beautiful. I actually find it troubling that I am seeing more and more scabbards as of late which seemingly surpass the craftsmanship of the swords they are meant to protect! Thanks very much guys, I appreciate it. As regards the chape, I pretty much agree with you. I love the design my client put forward and I think it too has a look that could have come from an alternate universe, a little different to ours, but not so much, however I tried to work closely to the brief and the sketches provided. Personally I would have slimmed the chape down myself as personal preference, but also I suspect I would not have come up with a chape that looked like this at all, so credit to my client for his thoughts. Is the upper and lower halves of the chape brazed together? It looks like a gap in #7. Otherwise, top notch; I'd never thought about matching a chape to the pommel - then again most of my favorite pommel types would look rather wrong on a chape! I would say that it is very pleasing, to say the least. It is borderline "spectacular". Any Elf worth his "Lembas bread" would be more then pleased to carry that!. Again , your work is so nice. 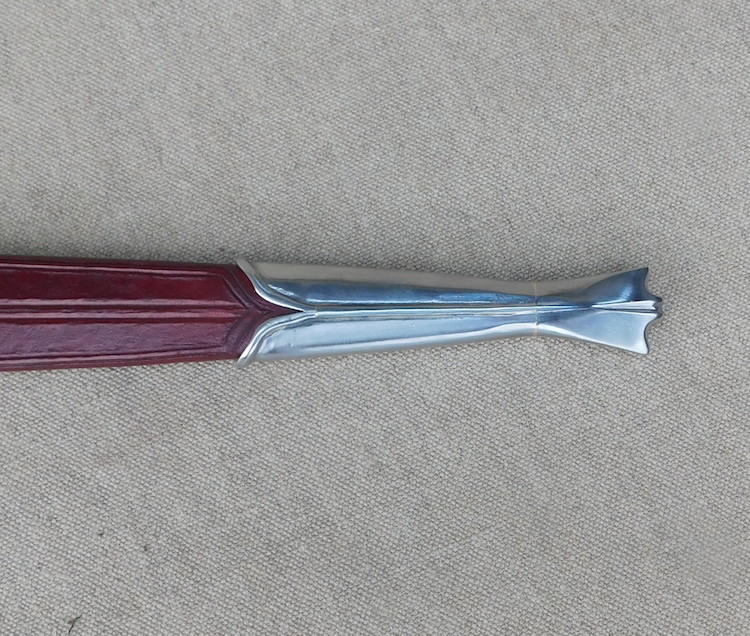 After my Dagger project is done I am going to commision a scabbed for my Albion Munich in gothic and I am loving how bright and shiny the very steel is. I've got some ideas for it but first things first.!!!. Beautiful work Tod.. I love this concept! Why NOT match the sheath design to the sword? Cudos to the designer and to Tod's execution of it. Thanks for the kind words guys and although not quite from this universe, I didn't really see it as an Elvish piece; if we are sticking with Tolkein, then I would say from the realm of men. If we're going Tolkien, that has Jacksonian Gondor written all over it. Wow that one's a beauty. I think the chape sets off the whole thing nicely.